Caroline Overington’s fiction polarizes. Some people, having read one of her books, swear off reading more. Others devour each one as it is published and eagerly await the next. I’m trying to tease out why. Overington chooses to write about topics which are highly emotive – melodramatic, even – topics which are often sensationalized in the news. Her books deal with murder within families, institutional neglect and abuse, and, most recently, in Can You Keep A Secret?, international adoption. All her books, including the latest, are page-turning, thought-provoking reads. To illustrate these topics, Overington depicts characters from the working or welfare-dependent classes, ill-educated people, sometimes mentally disturbed; people on the fringes of society who, at best, behave badly, at worst, could be seen as downright evil. When reading about these characters and what they get up to, it can be hard, as a middle-class, educated reader, not to feel voyeuristic and judgemental – and highly manipulated by the author. Some readers I know are uncomfortable at being put into such a position and stop reading. Others, like me, are fascinated and compelled to go on. Reading Overington’s fiction reminds me of a time I spent watching the Jerry Springer show (which I had to do as part of research for a cultural studies unit I was teaching years ago). On the show, mostly black, working class guests behaved badly for a (mostly, it seemed) white, middle-class audience. As I watched the guests’ antics, I knew I was being emotionally manipulated, but I could see viewers’ fascination and why, for some, it might even become addictive. While such “bad” behaviour was going on, seemingly in front of my eyes, I could feel just that little bit superior, reassured that my own faults and failings – and there are many – aren’t quite as bad as my conscience would suggest. I could feel that much more satisfied that I was okay; at least, I wasn’t like them. The pernicious element about Springer’s show was that it purported to be true, that the people used to create the show’s spectacles genuinely represent facets of society and actual human behaviour; and the viewing “eye” of the camera and Springer’s staging played no part in falsifying reality and in exploiting those guests for dramatic effect. Not so with Overington, right? After all, she writes fiction. Freed from the constraints of libel, Overington sees herself as being able to portray in fiction a clearer representation of human behaviour than she can as a journalist. That’s what I find disturbing – and thought provoking – about her work. If how she depicts humans is “true”, what does that say about humanity? Are we really so self-seeking, grasping, venal and deluded as many of her characters appear to be? Is it the novelist’s job to expose such behaviour? Satirists from Voltaire, Swift and Twain onwards would no doubt say it is, and that’s how I choose to see Overington’s writing: as satirical. Overington, as a journalist, has interviewed many people in distress, both victims and perpetrators of horrific crimes. She has had insights into experiences few of us could imagine – except if you’ve lived through them, or things similar. Coming at behaviour from the outside, as a viewer, it’s easier to get an overview, to simplify into neat packages of good and evil, sane and insane. It’s different when you’re part of the story. If you were to identify fully with one of the people Overington writes about, it might be harder to parcel off the moral worth of other humans’ actions without more ambiguity, subtlety and complexity; harder, one might say, to throw the first stone. This distinction may well reflect the difference between satirical writing and more literary writing. The satirical writer, like the sensationalist, opts for surface effect, making it easier to hold others up to ridicule; while the literary writer works hard to take us into the minds and hearts of those whom, because of their behaviour and experiences, we might otherwise objectify and reject. The satirical writer distances us from others; the literary writer reminds us of our common humanity. 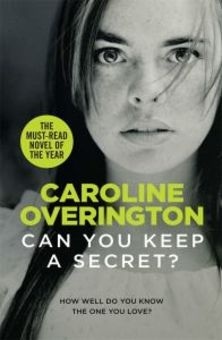 Right from the start, the style of Overington’s Can You Keep A Secret? creates distance. In the opening section of the novel, Overington uses an omniscient narrator to introduce the main characters: Caitlin, the working class girl from Townsville, and Colby, the stockbroker tourist from New York. As the story progresses the narrative focuses on Caitlin and her desire, by whatever means, to live the American dream and be a “mom”, but it’s not via the kind of deep, third-person subjective point of view that appears in much contemporary Australian fiction; rather, Overington creates distance by relying on dialogue and action to “show” Caitlin’s story: we are never fully invited into her head or to identify with her concerns. For those who feel bogged down by characters’ introspection, this stylistic levity is refreshing; it also better enables the reader to form a judgemental view of the main character and her behaviour. Even when the narrative switches to first person in the middle section of the story, Caitlin’s “blog” where she writes of her dream of adopting a child, we experience, along with her blog readers, only the illusion of intimacy: we know, from the prior narrative, Caitlin has kept important details from her readers, so we can’t trust what she tells us about herself and her experiences. Again, this makes it easier to judge her in the end. Overington’s style interests me, as does her boldness in writing the “truth” as she sees it. She is unafraid to polarise, to offend, to invite judgement of behaviour she sees as wrong. She has found a way of doing this, of critiquing aspects of society and human behaviour, while telling a page-turning story. With so many things wrong about the world, so much to complain about, such conviction and moral certainty is enviable. Maybe more Australian women writers could follow suit and be more satirical? Except, instead of depicting in a negative light the behaviour of society’s most vulnerable and weak, such writers – perhaps even Overington herself – might target those whose venality has a far greater negative impact: the corrupt elites and privileged classes who wield the most power. Do you agree Overington’s writing is satirical? Are there any other Australian women authors whose work could be seen in this light? A review copy was kindly supplied by the publisher. This response forms a part of my contribution to the Australian Women Writers Challenge and Aussie Author Challenge. Other books by Overington I’ve reviewed included No Place Like Home and Sisters of Mercy.